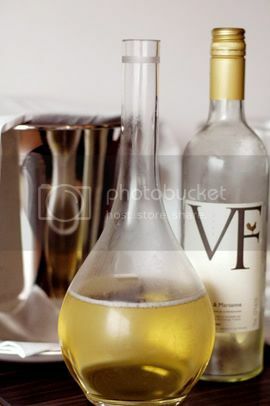 I’m a big fan of Viognier. It’s a wine varietal that I only discovered 4 years ago, and I’ve been hooked ever since. The first one I had was a D’Arenberg “The Last Ditch” Viognier. It was one of many wines served at an amazing al fresco lunch thrown for a bunch of foodies and winos by Tasting Australia and held at Geoff Hardy’s vineyard in McLaren Vale, South Australia. The Viognier was fresh from the barrel, poured into clear glass bottles by the winemakers at D’Arenberg, and rushed over to satisfy we hungry alcoholic-gourmands. The wine, we were told, wouldn’t actually be released for several months, so we were getting a special preview. I’ve also since learnt that New World Viogniers are often best drunk as early as possible, and we couldn’t have gotten this batch any earlier. It was sensational. Over the past few years, I’ve enjoyed tasting many Old World and New World Viogniers. I have to admit, oddly enough, I prefer many of the New World ones over the more well-known French Condrieus. One of my favourites is the Clay Station Viognier, a reasonably priced, multiple-award winner. I saw the above pictured wine, a Viognier-Marsanne blend, a couple weeks ago in the wine cellar of Singapore’s latest uber-chic (and expat oriented) gourmet store/café, Corduroy & Finch. I was amused by the bottle’s label. “How very un-French,” I thought, as I admired the clean, bold graphics. That all the other text was also in English meant that this wine was clearly designed for international export. I was especially tickled by the text on the bottle’s back label, which suggested the wine would go very well with Chinese food and a description of the wine itself, which read, “50% Viognier, 50% Marsanne, 0% cork.” Obviously, someone working in the marketing section of La Vieille Ferme wines has been having a helluva time amusing him or herself. Even if I wasn’t a big fan of these grapes, I would have bought the bottle based on the labels. The wine turned out to be only so-so. There was too much alcohol present in both its nose and on the mouth. I’m not sure if it would age well either. That said, I was pleased by the efforts that the winemakers (and their colleagues) made to make the wine extremely marketable and attractive. As I said, it looked, well, very un-French.